On 19 December, a three-fold increase in bread prices ignited public anger in the city of Atbara, which sits at the junction of the Nile and Atbara rivers, in northeastern Sudan. It was immediately followed by a series of protests in Khartoum and other towns. The protest movement was spearheaded and orchestrated by the Sudanese Professional Association (SPA), with active support from medical doctors, university staff, teachers, engineers and other groupings. Tasgut bas (just fall, that’s all) is the slogan around which all protesters united, as well as the demands listed in the "Freedom and Change" document that call for a transition period to agree on new constitutional and political dispensations. This popular uprising, however, has been a long time coming. The National Islamic Front (NIF) military takeover of 1989 ushered in a new phase in Sudanese politics characterised by total repression in the name of establishing an "Islamic state". Haunted by the spectre of modern forces leading protests against authoritarian regimes - as was the case in the Sudanese uprisings of 1964 and 1985 - the NIF leadership adopted systematic, oppressive measures designed to strip power from the country’s historic change agents: trade unions, professional associations and civil society organisations. To further secure their hold on power, the ruling Islamists managed shadowy, parallel agencies entrusted with running the affairs of formal government institutions from day one of the coup until the present. Hundreds of people have been taking to streets of a series of towns and cities in Sudan since 19 December 2018 to protest a government decision to remove subsidies on wheat and electricity. This has cause the price of bread to double, cash shortages and salaries left unpaid. The austerity measures adopted by the government are part of larger economic reforms proposed by the International Monetary Fund (IMF). The mobilisation on the ground against the price hikes - organised by a group known as the Sudanese Professionals Association (SPA) - found almost immediate resonance among opposition leaders, youth and women movements and rapidly turned into larger show of discontent with 75-year-old President Omar al-Bashir. However, three decades later, the Islamists' al-Mashru‘ al-Hadari - their "civilising project" - ended in dismal failure. In reality, the project has been kleptocratic. State resources are used to enrich a rentier, parasitic class that poses an existential threat to the survival of Sudan as a territorially integrated, modern state. Following the secession of South Sudan in 2011, the regime’s threats were magnified by the loss of the oil rents on which the leadership relied to grease the wheels of patrimonial autocracy. The protest movement shows the strong and obvious leading role of the country's younger generations. The body that rose to represent the movement, the SPA, is a very youthful organisation. This is to be expected, since Sudan's young people are most vulnerable to "existential threats". The dismantling of productive sectors through privatisation, sale of public assets, etc, undermined and weakened the organised labour movement, but it nonetheless provided skilled professions (in medicine, engineering, higher education) with the opportunity to develop as a potential rival force to government-controlled trade-unions. Despite the security apparatuses' monitoring and control, this potential force managed to keep the historic spirit of trade unionism alive. So, with hundreds of thousands of graduates, unemployed and armed with social media and IT skills, SPA organised anti-government protests across the country. Drawn from various professions and backgrounds, the SPA’s concept of change has yet to be developed on issues such as the promised political reform and "specifics of change". The focus of the SPA’s document, titled "Freedom and Change", is the call for the restoration of democracy. Other key issues were left untouched. With the secession of South Sudan, Khartoum lost about 75 percent of oil exports and 60 percent of its foreign currency earnings. Dwindling state rents heightened factional rivalry in the leadership's higher echelons. Efforts to carry out reform were hampered by a lack of political will, vendettas and power struggles among competing factions. Cutting public expenditure and down-sizing government failed. In fact, government spending increased almost to accommodate political allies. Production of gold could have almost compensated for oil revenue, but most of Sudan's gold production, according to officials, is smuggled outside the country. Corruption and mismanagement stifled huge financial inflow from oil-rich Arab countries. The government’s anti-corruption campaign fizzled out, only a few so-called "fat cats" were prosecuted and later had their sentences commuted. Spending on the army, the security service and the paramilitary was steadily increasing. The government seemed to be stuck in its own incompetence. It was against this background that the 2018 budget, with its severe austerity measures, was met with protests. Realising that some conciliatory measures had to be taken, a new government, led by a relative of the president Omar al-Bashir, was sworn in with a promise to breathe new life into the government’s ill-advised policies and dysfunctional institutions. However, the new prime minister’s "shock therapy" to deal with the economic crisis resulted in long queues at gas stations, banks and bakeries for months. The young prime minister’s unwarranted optimism was dashed away amid scepticism over the suitability of both his skills for the job and policies. With inflation spiking, the price of bread in some towns increased three fold, protests began in Atbara town and were immediately followed by a series of protests across the country. 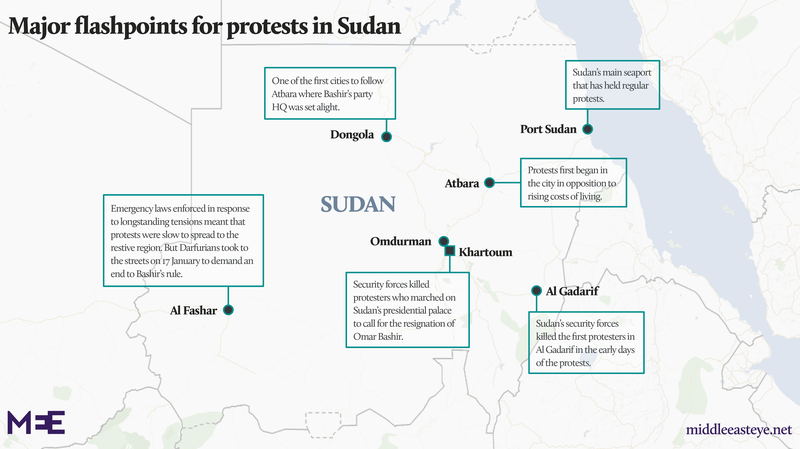 Protesters made clever use of their social media and IT skills (to overcome internet shutdowns), day and night demonstrations, sit-ins, press statements, and calls on the Sudanese diaspora to rally to seek diplomatic support. The government's response was brutal. According to Amnesty International, 37 have been killed in cold blood (the official figure is around 30), hundreds injured - some seriously - and thousands detained. Yet, while the security forces continued to brutally put down protests, some leaders of Bashir's ruling National Congress Party (NCP) kept sending mixed signals, acknowledging what some of their ministers called the "legitimate" and "reasonable" ambitions young people have for jobs and social space, and calling on the opposition to engage in a "national dialogue". Some politicians have advised the ruling party not to go ahead with amending the constitution to allow Bashir, in power since 1989, to run for re-election in 2020. Besides the SPA forces, opposition political parties have supported and participated in the protests. This does not apply to Arab and regional leaders, who took the government’s side. International actors made verbal condemnations of the excessive use of brutal force in putting down the protests. Rather than coming from regional or international forces, the initiatives for breaking the deadlock between the government and the SPA are coming from internal actors such as civil society organs and academics. In realpolitik terms, however ambitious the vision of the protest movement is, it has to influence the balance of power. This can be done through either bringing or leveraging change. With so much up in the air, bringing change along the lines of the 1964 October revolution and the military coup of 1985 might seem a little bit far off, but cannot be entirely ruled out. It is difficult to envisage the historic role played by the army as in 1964 and 1985, in particular with other competing power centres, such as the security service and the Rapid Support Forces, not to mention the Sudan People’s Liberation Movement (North), the Darfur rebel groups, and the "shadow battalions" of the Islamic National Front. At the time of writing, protests are still raging on. Both the protest movement and government have some miles left to run. Yet, as things stand now, one thing is apparent, and that is the current geopolitical configuration is giving the government some space to breathe. One may reasonably state that in the midst of its current protracted conflicts, internal divisions, and economic hardships, Sudan’s regime is in power solely because of the protective interests of stronger regional and international powers. This may change. David Landes put forward a law of social and political relationships, namely that three factors cannot coexist: A marked disparity of power; access of one group to the instruments of power; and equality among groups or nations. This means that if one group has access to power and is able to deliver a decisive strike and hold the balance of power, it will do so. In a fluid political landscape marked by a disparity of power relations, all options are possible. Sudan's political deadlock will be broken. We wait to see when and how. *Political Science professor. During 2003-2006 he was Head Department of Political Science, Faculty of Economics, and University of Khartoum; and from 2006 up to 2009 he was Country Manager of International Institute for Democracy and Electoral Assistance (International IDEA); and from 2009 up to 2011 he was a Senior Advisor for International IDEA in Sudan. He is currently the Chief Editor of Sudan Journal of Economic and Social Studies, published by University of Khartoum.